The latest "must have" tools are Tulip's Hiroshima Needles from Japan. BeStitched has a nice video on their shop website about these needles, with a little about their beading awl as well. These are high quality needles that are very smooth. They come in little glass jars with a cork stopper which is a nice touch. I was given a package of assorted sizes nearly two years ago, put them in a safe place, and forgot about them! But with all the buzz about these needles, when I found them again I pulled them out, choose what I think is a size 24 out of my package of assorted sizes, and have been stitching with it on my current project. My package of assorted tapestry needles has six needles, two each of size 22 and size 23, plus one size 24 and one size 25. You'll note that they have "between sizes" which aren't always easy to find. This assortment seems to run $8.50-$9 per box online. The needles themselves have a gold finish at the eye. In the photo above, the bottom needle (the one nearest the cork) is a size 24 I've been using exclusively on my last project over the last 5-6 weeks, which is probably 40 hours of stitching. If you enlarge the photo you will see how much the gold tip has faded on the needle as I used it. I have acid hands which take the plating off most needles. The needle also appears scratched around the eye when I examine it closely. I was stitching on 18 count canvas with normal threads for that type of canvas and not doing anything that might scar a needle like beading. 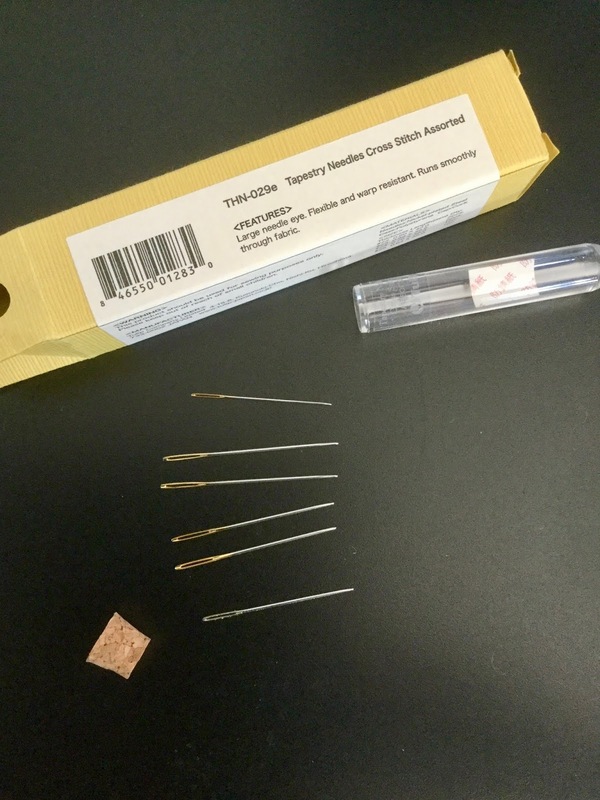 Folks say these are exceptionally smooth needles that are a little flexible, making them a good choice for folks with arthritic hands or wrist problems as there is less drag. (A friend with arthritic hands loves them!) They are more expensive than other brands available to us. I have heard that some folks find they break more often than their usual brand, but other folks say they break less. I didn't find them especially smooth compared to the Bohin or Piecemakers needles I normally use, however. 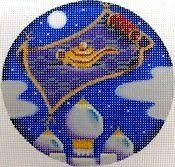 They didn't seem to be extra flexible to me but I think I've broken perhaps 1-2 needles since I taught myself to needlepoint in 1988! I liked them although having the plating come off because of my body chemistry means I will toss a needle after each project. I can use my Bohin and Piecemaker needles (my preferred brands) without noticing such damage so I can use them longer than just one project although I often don't do that if I used the needle extensively. Here's what Mary Corbet says about them. 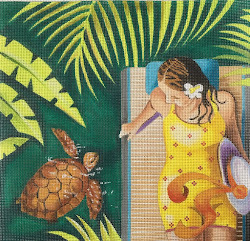 Remember, Mary is an embroiderer, not a needlepointer, so she's stitching things differently than we needlepointers do. Here's a little more information on these needles from Melita. Tulip has beading needles as well as tapestry needles which are supposed to fit inside bead holes well and also sell a beading awl, which can be used as a laying tool. 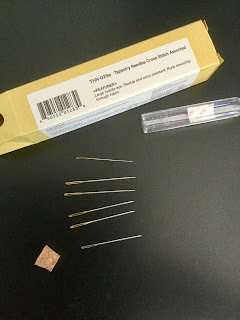 If you need a really small beading needle you might want to check out the Tulip beading needles. Bottom line: My acid hands mean I damage these needles after just one project. I like Bohin and Piecemaker needles just as well without seeing so much damage on them, so I probably won't buy more Tulip needles for regular use. (I do want to try the beading needles, though.) I think folks with arthritis might want to invest in a packet to see if they help make stitching easier. I also think that if you break a lot of needles, these might also be worth a trial. These needles won't work for everyone as we all stitch differently. If you like the brand you normally use, stick with it. If you have issues, try the Hiroshima needles from Tulip. They might be the answer to your needle problems. UPDATE: Amy Bunger has done a review of Tulip needles in her January 2019 newsletter. © Copyright June 15, 2018 Jane M. Wood. All rights reserved. I use these needles and love them! So far I've had no issues with the gold coming off or breakage. Of course, I haven't examined them with a magnifying glass, so I could be wrong. But I do enjoy stitching with them and have switched from a Bohin needle (I have those too and want to use them up) to a Tulip needle sometimes. I just found out that Web Fabrics (www.webfabrics.net) in Purcellville, VA, carries all of the Tulip needles. It's a quilting shop, so when I say all, it includes milliners, embroidery, tapestry, chenille, leather, beading, and others I can't recall. I should note that the size range of their tapestry needles is pretty much what you get in the package you received, but you can get tubes of individual sizes as well. 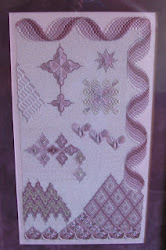 Now I have another reason to visit Web (not a quilter) besides the wonderful Cosmo cotton floss. Good to know that you can get the Tulip needles at Web Fabrics. I usually stop there for Finca perle cotton balls or some Cosmo floss but haven't looked at their needles for a long time. Next vet visit (our vet is just down the hill) I'll make a stop. Thanks! I've used the sashiko and beading needles, and I love them. I've since bought a few other boxes (tapestry, milliners and chenille) but haven't had the chance to use them yet. Hope you like them as much as the beading and sashiko needles!